It's like a flash drive on steroids. 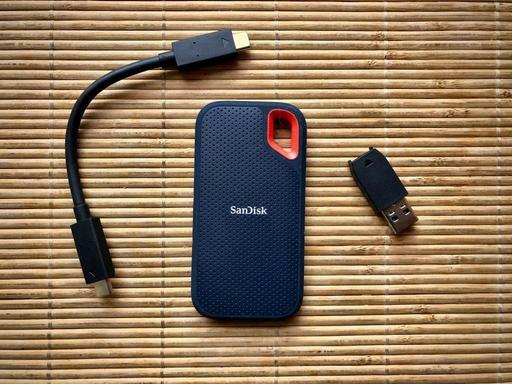 The SanDisk Extreme 500GB Portable SSD (on sale for $109) is fast, sleek, and super nimble. 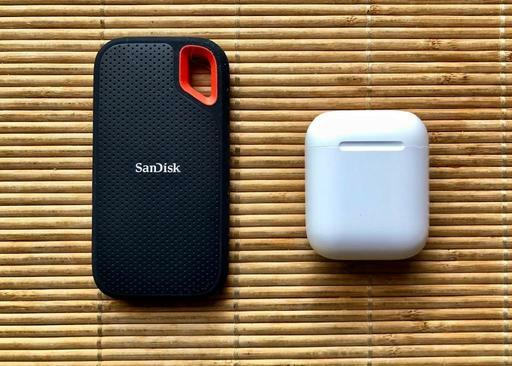 The SanDisk 500 GB SSD next to my Apple AirPods. When you look at a picture of the device online, you might not realize that it weighs just 39 grams and is less than 2" wide. It's small. Yet, the SanDisk SSD has very impressive specs. High-speed transfers with up to 550MB/s read speeds. Water Resistance Rating: IP55 for water and dust resistance. Dimensions: 0.348 x 1.951 x 3.787 in. (8.850 x 49.550 x 96.200 mm). Weight: 0.086 lbs (38.9g). USB Type-C to Type-C cable; Type-C to Type-A adapter included. I loaded a 65 GB Capture One Pro library on to the portable SSD and took it for a spin with my RAW files. Once it was connected to my MacBook Pro via the USB-A adapter, I applied a variety of edits, performed searches, filtered by star rating, and exported sampled-down jpegs. The SanDisk did not even blink. Kit includes USB-C cable and a USB-A adapter if you need it. The SanDisk Extreme 500GB Portable SSD is currently on sale for $109 (normally $169) with free 2-day shipping for Amazon Prime members. I think it's worth every penny.